In 2017 the literary world will commemorate the 200th anniversary of the death of Jane Austen in a year packed with exhibitions, talks, walks and performances — as well as her appearance on the British £10 note. The first two centuries of Jane's contributions are celebrated in The Joy of Jane: Thoughts on the First 200 Years of Austen's Legacy. Published by Lansdown Media (the fine people who bring you Jane Austen's Regency World magazine), this anthology features essays on Jane's endearing appeal, written by some of today’s leading writers and authorities. 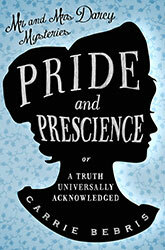 My contribution to this work discusses Austen's Legacy to Novelists, and the lessons all writers can learn from her. It's an honor to appear in this collection alongside that of so many well-respected Austen experts and writers, including Maggie Lane, Deirdre Le Faye, Susannah Fullerton and Kim Wilson. The book also includes a reproduction of Reginald Farrer’s seminal essay from The Quarterly Review from July 1917, which marked the 100th anniversary of Jane Austen’s death. The Joy of Jane was published in the UK in September, and will make its US premiere at the JASNA AGM in Washington DC, October 21-23. If you're not able to attend, you can order a copy directly from the publisher at www.joyofjane.com or from Jane Austen Books. I'm excited to announce that UK mystery publisher South Downs Crime & Mystery (an imprint of Oldcastle Books) has picked up the United Kingdom and Commonwealth paperback and ebook rights to the first three Darcy mysteries. The official publication date for the ebooks is 6 October, with paperbacks to follow in January of 2016. For a limited time in October, some readers will also have the chance to purchase the ebook editions at an exceptional bargain. Amazon Kindle Countdown Deals have been scheduled for all three titles, starting at just $0.99/£0.99 on the .com and .co.uk store sites respectively. Amazon.com users in the Commonwealth (those who don't have an Amazon store of their own and Australian readers who haven’t transferred their accounts to amazon.com.au) will be able to purchase the ebooks for $0.99 starting on 12 October, 2015. Some titles will gradually increase in price throughout the promotion, returning to the full list price of $4.99 on 19 October, so take advantage of this offer early to get the best deal. A similar promotion will begin on Amazon.co.uk on 13 October, running until all titles return to the full list price of £3.99 on 20 October. Note that this promotion is available only in the countries where South Downs has distribution rights, so unfortunately it will not be available to Amazon.com users in other countries, including the United States and Canada. If you're not in the United Kingdom or the Commonwealth, please spread the word to friends and acquaintances who are!